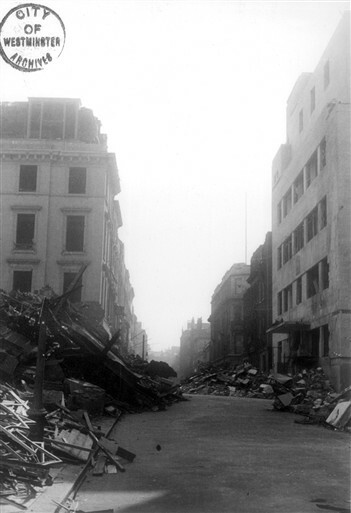 Savile Row W1 suffered bomb damage on 16 and 24 September 1940. 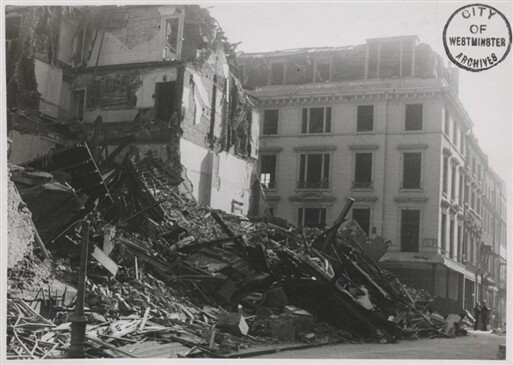 On 16 September, a high explosive bomb completely demolished a house at 7 Savile Row, damaging adjacent properties. The bomb shattered surrounding windows and blew debris into the street. A coal gas leak was discovered and a “no smoking” notice was immediately posted before utility crews arrived to seal it off. 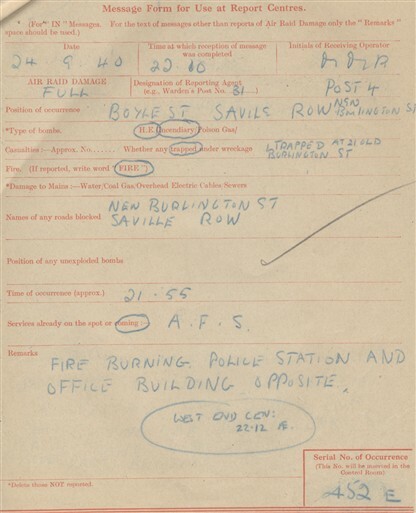 At around 9.55pm, 24 September, 1940, 21A Savile Row was first set alight by incendiaries and then suffered a direct hit from a high explosive bomb. Parts of the recently-opened West End Central Police Station and offices on the opposite side of the street were badly damaged by blast. 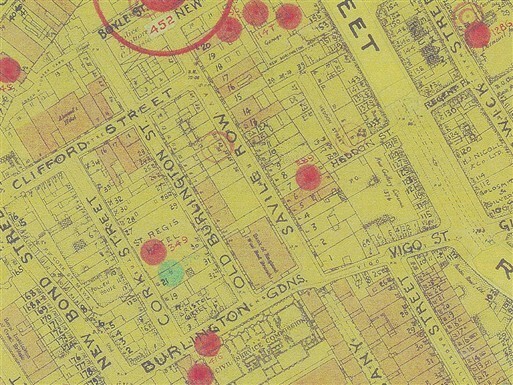 Soon after, a parachute mine - the first to fall in Westminster - caused massive damage at the corner with Boyle Street and in the vicinity of the police station. The station's glass partitions were completely shattered; flying fragments resulted in multiple injuries. Ensuing fires were tackled by the Auxiliary Fire Service (AFS) until the next morning. New Burlington Street and Savile Row were blocked by debris. Thirty casualties were attended to by ambulances working in relays. One casualty was trapped at 21 Old Burlington Street and one in a car at 10 Cork Street. Several policemen were reported hurt; three were later confirmed as fatalities. Extensive damage was also caused to coal gas mains and electricity lines in the garage and the local water mains burst the next day. I would like to add that three Police Officers were killed and a further twenty two were injured in that incident. West End Central Police Station had opened on 14th July 1940. Consequently, it was open for only for about ten weeks. At The time of opening, it was regarded as the most modern Police Station in the world! I believe my Granfather lived here during time of the bombing and his flat was damaged. His name was Stanley Ogden. Not sure what rank but he later went on to run Isle of Man internment camp. I have photo of my grandmother looking down from the roof onto damage. My Grandad Robert Errington worked there until the 1970's. I am researching Sandon and Co tailors as I have a suit that they made in October 1939. Barry Bayliss this could be something your farther worked on. While going through an old box of buttons, I have come across buttons monogrammed RFH or possibly PFH. These are stamped Sandon and Co. Savile Row.